Garou Across the World... The War of the Apocalypse rages across the globe as the Wyrm seeks to destroy Gaia. The Garou preserve the legends of an idyllic world that existed before the corruption brought about by humanity and the Wyrm. They battle those evils to the death to bring about a new Golden Age, but can Gaia still be saved. Strike Back Now you can fight the War of the Apocalypse from its earliest days. 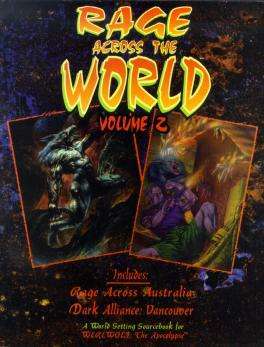 Rage Across the World Volume 2 is a compilation of two classic Werewolf sourcebooks: Rage Across Australia and Dark Alliance: Vancouver. Previously out of print and almost impossible to find, these books are now repackaged under a new cover. Rage Across Australia and Dark Alliance: Vancouver, two of the earliest Werewolf supplements ever released. Important information on the worldwide society of Garou, and the Leech infestation of Vancouver. How far do the Wyrm's tentacles reach? A last chance to claw at the heart of the Wyrm - before there's no stopping it.